First off, here are a few pictures of me. The 1st is a picture my dad made of me in the summer of '94 somewhere in the French Alpes. According to him this is a very characteristic pose for me. The next one was taken during my visit in the summer of '96 of some friends (AKA the 'Evil Swiss' :) I made through email. One of the things we did during this meeting was visit an old mine, hence the helmet. Or hear my voice being 'musically abused' (WAV 435Kb) as run-up to Rien's 'Voice Project'. 1) Want to see and know more about me, or what I've been up to lately ? Go right ahead and take a look at the 'Me-page'. 2) Want ton know who my girlfriend is ? Her name is Kiki. To see more of her got to the Friends section, directly to her site or visit the site I made for her. 3) Want to know about my family ? Have a look in the Family-section. 4) Want to know what pets I have ? 5) Interested in who my friends are ? Well, they're not all on here yet, but there is a start in the Friends-section of this site. 6) Want to know where I live & work ? 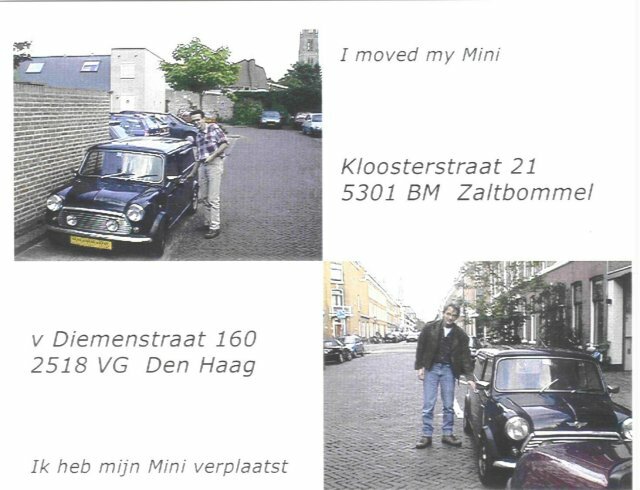 I used to live in a small house in Zaltbommel and work at Finalist in Rotterdam. But I've moved in with Kiki and now live in The Hague (or 's Gravenhage or Den Haag as it's called). 20 ) Want to 'test' me ? On one of my other sites you can find my pride and joy; the Mini. I also own a (motor)bike; a Yamaha XT 500 that I enjoy playing around with.